This review is an abridged version of a Cochrane Review previously published in the Cochrane Database of Systematic Reviews 2010, Issue 4, Art. No. : MR000013 DOI: 10.1002/14651858.MR000013.pub5 (see www.thecochranelibrary.com for information). Cochrane Reviews are regularly updated as new evidence emerges and in response to feedback, and Cochrane Database of Systematic Reviews should be consulted for the most recent version of the review. Objective To identify interventions designed to improve recruitment to randomised controlled trials, and to quantify their effect on trial participation. Data sources The Cochrane Methodology Review Group Specialised Register in the Cochrane Library, MEDLINE, EMBASE, ERIC, Science Citation Index, Social Sciences Citation Index, C2-SPECTR, the National Research Register and PubMed. Most searches were undertaken up to 2010; no language restrictions were applied. Study selection Randomised and quasi-randomised controlled trials, including those recruiting to hypothetical studies. Studies on retention strategies, examining ways to increase questionnaire response or evaluating the use of incentives for clinicians were excluded. The study population included any potential trial participant (eg, patient, clinician and member of the public), or individual or group of individuals responsible for trial recruitment (eg, clinicians, researchers and recruitment sites). Two authors independently screened identified studies for eligibility. Results 45 trials with over 43 000 participants were included. Some interventions were effective in increasing recruitment: telephone reminders to non-respondents (risk ratio (RR) 1.66, 95% CI 1.03 to 2.46; two studies, 1058 participants), use of opt-out rather than opt-in procedures for contacting potential participants (RR 1.39, 95% CI 1.06 to 1.84; one study, 152 participants) and open designs where participants know which treatment they are receiving in the trial (RR 1.22, 95% CI 1.09 to 1.36; two studies, 4833 participants). However, the effect of many other strategies is less clear, including the use of video to provide trial information and interventions aimed at recruiters. Conclusions There are promising strategies for increasing recruitment to trials, but some methods, such as open-trial designs and opt-out strategies, must be considered carefully as their use may also present methodological or ethical challenges. Questions remain as to the applicability of results originating from hypothetical trials, including those relating to the use of monetary incentives, and there is a clear knowledge gap with regard to effective strategies aimed at recruiters. Despite representing the gold standard in evaluating the effectiveness and safety of healthcare interventions, many randomised controlled trials do not meet their recruitment targets. Poor recruitment can lead to extended study duration, greater resource usage and findings that are not as statistically precise as intended; in the worst case, a trial may be stopped. A systematic review was carried out to identify methods used to improve recruitment to randomised controlled trials, and to quantify their effects on participation. There are promising strategies for increasing recruitment to trials, most notably telephone reminders, open-trial designs, opt-out strategies and financial incentives. Many trials of recruitment methods involve hypothetical trials, and the applicability of their results to the real world is still unknown. There is a clear knowledge gap with regard to effective strategies aimed at those recruiting to trials. This Cochrane review utilised a comprehensive search and appraisal strategy, thereby ensuring that all relevant evidence was included. Many of the included studies were small, increasing the likelihood of their being underpowered, and resulting in CIs that included the possibility of substantial benefit. The interventions evaluated by included studies varied greatly, making it difficult to pool data for met-analysis. Randomised controlled trials represent the gold standard in evaluating the effectiveness and safety of healthcare interventions, primarily because they help guard against selection bias.1 Nonetheless, the recruitment of clinicians and patients to these studies can be extremely difficult.2 While there are several possible consequences of poor recruitment, perhaps the most crucial is the potential for a trial to be underpowered.3 In such circumstances, clinically relevant differences may be reported as statistically non-significant, increasing the chance that an effective intervention will either be abandoned before its true value is established, or at the very least, delayed as further trials or meta-analyses are conducted. Similarly, while poor recruitment can be addressed by extending the length of a trial, this too can create delay in the roll-out of a potentially effective intervention, while increasing the cost and workload of the trial itself. We included randomised and quasi-randomised controlled trials, including those recruiting to hypothetical studies, that is, where potential participants are asked if they would take part in a trial if it was run, but where no trial exists. Studies examining ways to increase questionnaire response rates, evaluating the use of incentives or disincentives to increase clinicians’ recruitment of patients or studying strategies to improve retention were excluded as these are addressed by other Cochrane Methodology Reviews (CMR).11–13 The study population included any potential trial participant (eg, patient, clinician and member of the public), or an individual or a group of individuals responsible for recruiting trial participants (eg, clinicians, researchers and recruitment sites). A recruitment intervention was defined as any method implemented to improve the number of participants recruited to a randomised controlled trial, whether this was directed at potential participants, at those responsible for recruiting participants or at trial design or co-ordination. Interventions used in any study setting were included. The outcome of interest was the proportion of eligible individuals or centres recruited. Titles and abstracts of identified studies were independently screened for eligibility by two reviewers. Full text versions of papers not excluded at this stage were obtained for detailed review. Potentially relevant studies were then independently assessed by two reviewers to determine if they met the inclusion criteria. Differences of opinion were discussed until a consensus was reached; the opinion of a third reviewer was sought when necessary. Data extraction of included studies was carried out independently by two reviewers (ST with EM, PL or MP) using a pro-forma specifically designed for the purpose. Data were extracted on trial design, study setting, participants, inclusion and exclusion criteria, interventions and outcomes evaluated and results. In addition, data on the method of randomisation, allocation concealment (adequate, clear and inadequate), blinding (full, partial and none), adequacy (objective, unclear and subjective) and reporting of outcome measures and level of follow-up were collected to allow the risk of bias in each study to be determined.14 This was independently assessed by the same two reviewers, and summarised in line with Cochrane guidance (A, low risk; B, moderate risk and C, high risk).15 Studies at a high risk of bias were not excluded, but results were interpreted in light of this. Data were processed in accordance with the Cochrane handbook.15 Trials were grouped according to the type of intervention evaluated (eg, monetary incentives, alternative forms of consent, etc), with intervention groupings based on similarities in form and content. Where available, binary data were combined as risk ratios (RR) and the associated 95% CIs generated. Cluster randomised controlled trials were included only where there were sufficient data to allow analyses that adjusted for clustering. In such a case, an odds ratio (OR) was used as the summary effect in the meta-analysis, with the pooled result subsequently being converted to an RR using the average comparator group risk. Heterogeneity was explored using the χ2 test, and the degree of heterogeneity observed (ie, the percentage of variation across studies due to heterogeneity rather than to chance) was quantified with the I2 statistic. Where there was substantial heterogeneity, we informally investigated possible explanations and summarised data using a random-effects analysis if appropriate. Subgroup analyses were planned to explore key factors considered to be potential causes of heterogeneity, namely (1) trial design (randomised vs quasi-randomised); (2) concealment of allocation (adequate vs inadequate or unclear); (3) study setting (primary vs secondary care; healthcare vs non-healthcare); (4) study design (open vs blinded; placebo vs none); (5) target group (clinicians, patients and researchers) and (6) recruitment to hypothetical versus real trials. However, there were too few studies evaluating the same or similar interventions to allow these analyses to be conducted. Similarly, it was not possible to explore publication bias. The search strategy identified 16 334 articles, of which 301 appeared to meet the inclusion criteria and were subject to detailed review (figure 1). We retrieved the full text of an additional 10 papers identified from the reference lists of previous reviews, and one article published out with the search period but which appeared relevant, giving a total of 312 potentially eligible studies. Forty-five papers, targeting more than 43 000 individuals, were included in the final analysis. Nineteen studies evaluated recruitment to hypothetical trials (table 1). Flow of studies into the review. Almost half of the studies were carried out in North America (n=21; 47%), with the remainder located in Europe (n=18; 40%) and Australia (n=5; 11%). One study involved centres in 19 countries worldwide. Studies were comparatively small in size, involving between 6 and 2561 participants (mean 493; median 79). It was not possible to determine actual participant numbers for two studies aimed at recruiters. In a further six studies evaluating recruitment to hypothetical trials, the number willing to participate was unclear, or was reported as a mean score. In more than half of the studies, participants were recruited from secondary care (n=23), or from secondary care in combination with another setting (n=2). Trials based in the community (n=8) or in primary care (n=6) were also common (table 1). All of the studies were described by their authors as being either randomised (n=41) or quasi-randomised (n=4), but more than a third failed to provide details of the method used to achieve this. Similarly, while allocation concealment was adequate in half of the studies, details were poorly reported in many others. This was also true in relation to the procedures used to blind participants, which was often missing or not fully reported. All studies provided details on the outcome measures used, many of which were subjective (eg, willingness or intention to consent). When considered across the domains, 12 studies had a low risk of bias, 13 had moderate risk and 20 had a high risk (table 1). The 45 included studies evaluated 46 interventions across six main categories: trial design, obtaining consent, approach to participants, financial incentives, training for recruiters and trial co-ordination (table 2). As might be expected, the majority of studies were aimed directly at trial participants (n=40), with few studies targeting those responsible for recruitment. Although some of the categories incorporate several studies, we considered the majority of interventions to be sufficiently different to make pooling them inappropriate. Where reported data did not allow for calculation of an estimate of effect based on our outcome measure, the results from the paper have been presented. Effects of the interventions studied are presented in table 3 and figures 2⇓⇓⇓⇓–7; only those figures relating to pooled estimates have been presented. Recruitment with open and blinded trial design. Recruitment with consent to experimental, standard and usual consent procedure. Recruitment with audiovisual and standard trial information. Recruitment with clinical trials booklet and standard trial information. Recruitment with invitation including study questionnaire and standard invitation. Recruitment with telephone reminder and standard follow-up. Six studies (5675 participants; one study also recruited 28 general practices) considered the effect of trial design changes on recruitment. Two trials16 ,32 compared an open design (where participants know what treatment they are receiving) with a blinded, placebo-controlled design, and found that an open design improved trial recruitment (RR 1.22, 95% CI 1.09 to 1.36; figure 2). A study investigating the impact of a placebo group on women's willingness to participate in a hypothetical hormone replacement trial59 suggests that the number likely to take part may be less when a non-active comparator is included (RR 0.76, 95% CI 0.59 to 0.99). A trial of menorrhagia management compared conventional randomisation with a patient preference design, where those with a preference for a specific treatment receive it, while the remainder are randomised.18 Although this made little or no difference to the number who agreed to be recruited to the trial, women were more likely to participate in the study overall (96% vs 70%). Five studies (4468 participants) considered modifications either to the consent process (including timing) or to the format of the consent form. In a trial on decision aids for colorectal cancer screening,55 the use of opt-out (potential participants were contacted unless they withdrew their details) was found to improve recruitment when compared with an opt-in approach to contact (RR 1.39, 95% CI 1.06 to 1.84). Two studies recruiting to hypothetical trials (one on a new drug and one on anaesthesia) evaluated various combinations of prerandomisation and consent.48 ,50 Both evaluated consenting specifically for the experimental or standard treatment, but there was considerable heterogeneity for the latter (I2=93%), and under a random-effects model, neither form of consent may lead to any difference in recruitment (figure 3). Three other variants of consent were also considered: (1) consent allowing those refusing participation to choose between the treatments,50 (2) consent to a 70% chance of receiving the experimental treatment because the clinician believes it is better48 and (3) consent to a participant-modified chance of receiving the experimental treatment (60%, 70% and 80%).48 All three appear to have had little effect on recruitment compared with usual consent. Two trials dealt with how the consent form was presented to potential participants. Researchers in a smoking cessation trial56 compared the effect of the consent form being read aloud by the researcher with it being read by participants, while a cluster trial recruiting to oncology studies evaluated an easy-to-read version of the consent form.19 Neither study found that the intervention improved recruitment. Twenty-eight studies (31 910 participants) evaluated the effect of modifying trial information or the way it was delivered. Nine studies considered various ways of providing potential participants with information about the trial. Studies using video or other audiovisual materials had mixed results. A study evaluating the effect of providing a 10 min video alongside written information in a trial of pregnant women with prelabour rupture of membranes60 found that this most likely improved willingness to participate compared with written information alone (RR 1.75, 95% CI 1.11 to 2.74). There were three studies presenting audiovisual overviews of clinical trials (including risks and benefits, randomisation and value to society) for a range of cancer studies (figure 4),21 ,22 ,33 one using interactive computer information in a hypothetical trial on managing complications after heart attack36 and another using video plus a pamphlet for a hypothetical HIV vaccine trial,28 but all found little or no difference in recruitment. Interactive computer presentation compared with audio-taped presentation in a hypothetical cancer trial44 slightly improved recruitment (RR 1.48, CI 95% 1.00 to 2.18), while showing a multimedia presentation of key trial information while a research assistant was available to answer questions, appears to have had little impact compared with just the research assistant in a hypothetical drug trial for schizophrenia.35 Finally, a study using a brief verbal education session for Spanish-speaking women eligible for a trial on high breast cancer risk45 found slightly improved recruitment compared with print materials alone (RR 1.14, 95% CI 1.01 to 1.28). Five studies considered the effect of supplementing usual trial information with additional materials. Two studies evaluated the inclusion of a booklet on clinical trials, one in a hypothetical breast cancer trial,23 the other in a real trial for HIV patients,34 while two trials on physical activity31 and injury prevention37 included study-relevant questionnaires with the invitation letters to potential participants. All four interventions made little or no difference to recruitment (figures 5 and 6). In the final study, the authors investigated the effect of including a newspaper article publicising the trial.51 This led to little or no difference in recruitment, even when the article was replaced with one that was more favourable to the trial. A consent form describing a new medication that ‘may work twice as fast as usual treatment’ most likely increased recruitment compared with one describing it as working ‘half as fast’ (RR 1.62, 95% CI 1.10 to 2.37),52 while describing treatment as ‘new’ rather than ‘standard’ may have slightly decreased recruitment (RR 0.81, 95% CI 0.66 to 0.99).38 Similarly, emphasising the pain or risk involved in a trial most likely decreased recruitment (RR 0.55, 95% CI 0.36 to 0.85 and RR 0.41, 95% CI 0.24 to 0.68, respectively).54 Neutrally framed information about side effects and survival compared with negatively or positively framed information43 appears to have led to little or no difference in recruitment. Two studies investigated the effects of disclosing the financial interests of those involved in the trial. In the first, a hypothetical heart disease trial, three scenarios outlining the investigators’ interests were presented.57 Willingness to participate reduced when the investigator had an investment in the drug company, compared with no disclosure (p=0.03) or per capita research payments to the investigating institution (p=0.01). In the second study, five scenarios were presented to research-interested adults with asthma or diabetes.58 Again, willingness to participate was lowest when the investigator had an investment in the drug company, and highest when the company paid the running costs (p<0.001). Three studies used telephones as a means of contacting potential participants. Two trials (on returning sick-listed people to work49 and activity in older people31) found that using telephone reminders to follow-up written invitations improved recruitment (OR 1.95 95% CI 1.04 to 3.66; figure 7), although there was moderate heterogeneity related to the magnitude of effect (I2=59%). In the third study, a series of SMS messages containing quotes from existing recruits were texted to potential participants of a smoking cessation trial.26 This improved recruitment compared with the standard written invitation (RR 35.09, 95% CI 2.12 to 581.48), although small numbers overall led to a wide CI. Four studies considered the use of different methods for screening potentially eligible participants. In a study recruiting African Americans to a cancer trial,24 conducting baseline screening and data collection at face-to-face church sessions most likely improved recruitment compared with standard procedures (RR 1.37, 95% CI 1.05 to 1.78). In two other studies evaluating willingness to take part in a hypothetical lifestyle trial, face-to-face (researcher) eligibility screening was compared with telephone screening,20 and with varied methods of participant self-completion of a screening questionnaire.29 Telephone screening may have improved willingness to participate compared with researcher administration20 (RR 1.26, 95% CI 1.06 to 1.50), but neither face-to-face administration nor electronic completion led to any difference in recruitment compared with standard self-completion on paper.29 A fourth study recruiting to chronic depression treatment trials46 incidentally reported on the influence of screening personnel, comparing senior investigators with research assistants, but this had little impact on recruitment. Two studies, one with 98 recruiters and the other with 126 recruiting centres, considered interventions aimed at those recruiting, both involving educational packages.39 ,40 One study evaluated training Hispanic participants in a prevention trial as lay advocates—Embajadoras—to refer other Latinas to the study.40 Data analysis did not correct for clustering and no ICC was provided, but the authors reported that more Embajadoras recruited to the trial than either untrained Hispanic or Anglo controls (8/28 vs 0/26 and 2/42, respectively). The second study, a cluster trial involving 126 centres in a cancer and leukaemia research network, compared the standard input for recruiters with an educational package (including a symposium and monthly mailings) aimed at improving recruitment of older participants.39 Although centre-level data and ICC were not provided, clustering was considered in the analysis, and the authors found that additional education did not significantly influence recruitment (31% vs 31%, p=0.83). Two studies involving a total of 302 trial sites looked at the effect of greater contact from the trial co-ordinators. In the first, a breast cancer trial, 68 of the 135 recruiting centres received on-site visits (including an initiation visit to review the trial protocol, etc), while the remainder received none.41 In the second, an international diabetes trial, additional communication from the co-ordinating centre (frequent emails, individually tailored feedback on recruitment, etc) was compared with usual communication.47 Neither study presented the proportion of eligible participants, but both reported finding little difference in recruitment when site visits were made (302 with visits vs 271 with no visits), or when communication was increased (median number of recruits 37.5 vs 37.0 for standard communication). 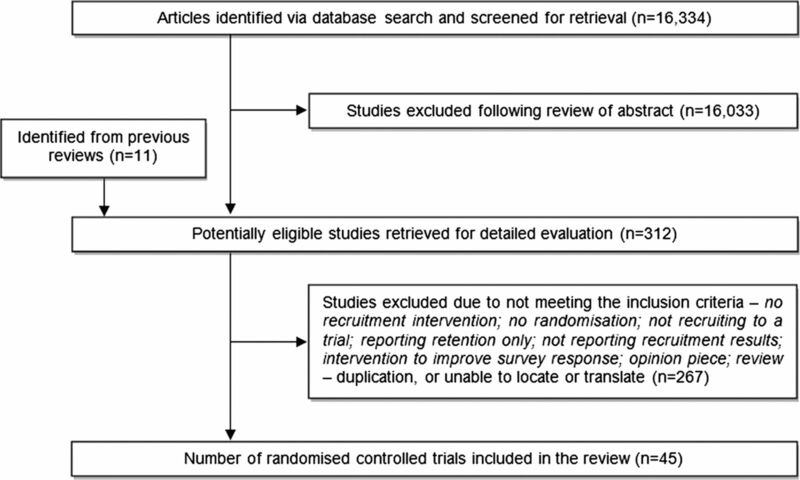 In this systematic review, we assessed the evidence from 45 trials evaluating the effect of intervention strategies designed to improve recruitment to randomised controlled trials. We found that a number of interventions do appear to be effective, although the evidence base related to some is still limited. Telephone reminders to non-responders,31 ,49 opt-out procedures requiring potential participants to contact the research team if they do not want to be contacted about a trial,55 including a financial incentive with the trial invitation,26 and making the trial open rather than blinded16 ,32 all improved recruitment in high-quality studies involving real trials. The effect of other strategies to improve recruitment, however, remains less clear. Although partial preference designs may improve participation in a study as a whole, they appear to have little impact on recruitment to randomisation,18 and with the exception of the opt-out approach already mentioned, a variety of strategies involving changes to consent procedures failed to produce any increase in recruitment. Similarly, modifications to the method or quantity of information presented to potential participants—either about trials in general or about a specific trial—did not provide clear evidence of the benefit of this approach to improving recruitment. Providing information to prospective participants in the form of quotes from existing participants via SMS shows potential, but it was evaluated in a single study,26 and requires further evaluation. Few studies looked at interventions aimed not at potential participants but at those recruiting them,39–41 ,47 and none presented clear evidence in favour of the strategies used. While several of the interventions studied show promise, there are some caveats. Pooled analysis for telephone reminders had moderate heterogeneity (I2=59%), although it would appear that it is the magnitude of effect rather than the benefit of the intervention that is in doubt. Similarly, while the inclusion of a financial incentive as used by Free et al26 did improve recruitment, the number of participants recruited was small, leading to uncertainty about the magnitude of effect. Two additional studies involving financial incentives found that increasing payment led to increased recruitment,17 ,30 but these involved hypothetical trials as well as sums of money that might not be feasible when recruiting to real studies. In addition, ethical concerns have been raised about the use of some of these strategies. Telephone reminders and financial incentives have both been used and accepted by many as a legitimate recruitment tool, but they may be considered by some to be a form of coercion. Opt-out procedures have previously been proposed as a way of improving recruitment to health research,61 but this approach remains controversial, as ethics committees generally require that research participants provide express approval for research participation, including being contacted about the study by researchers. However, it is worth noting that the trial included in this review55 studied opting-out of being contacted about a trial rather than opting-out of consenting to trial participation. This may be viewed as being less controversial, and as such, ethics committees may be more willing to accept it as part of a recruitment strategy. Finally, while it may be easier to recruit to an open trial rather than a blinded trial, there is clearly a greater risk of bias involved, and it is therefore an approach that requires careful consideration before being implemented. Many of the studies included in this review were small, likely to be underpowered and with CIs including the possibility of substantial benefit. This is particularly true of interventions that modified the approach made to potential participants. In addition, 19 studies involved hypothetical trials, and the implications of their results for real trials are still unclear. The interventions used by studies varied significantly, making it difficult to pool data. Even those studies adopting the same basic approach, such as altering the consent process, were generally sufficiently different to make pooling inappropriate.62 For example, while there were five studies of seven interventions looking at changes to consent procedures, only two interventions were comparable enough to be pooled. Similarly, video presentations were used in six studies but generally delivered different information, or were used in combination with other interventions that differed between studies. Consequently, only three could be combined in the same analysis. At the outset of the review, we had planned to undertake a number of subgroup analyses of the key factors considered relevant to heterogeneity, but variations in the interventions themselves would have made these comparisons meaningless. One such subgroup related to the impact of recruiting to a hypothetical trial versus a real trial. There was, however, only one comparison where there was at least one of each type of trial, and we were therefore unable to assess this factor. Only one of the cluster trials31 provided sufficient data to allow an appropriate analysis to be incorporated in the review. In addition, there were a number of studies which potentially had data clustered by the study the participant was invited to join, even though participants were individually randomised. As such, estimates from these studies may be overly precise. Potential bias was also a problem in many of the studies, often linked to hypothetical trials. Although allocation concealment was considered high quality for 22 of the 45 trials (it was unclear for 16 and poor for 7), the overall assessment of the risk of bias was considered as low for only 12 studies. Twenty trials were considered to be at a high risk of bias. It was not possible to predict the direction of effect that any bias may have had on study outcomes. In addition, we were unable to make statistical judgements about the likelihood of publication and related biases due to the relatively small number of included studies per comparison, and the wide variation in the recruitment strategies being evaluated. However, this review provides an update to previous reviews in the field, identifying a greater number of relevant studies and presenting new evidence relating to trial design (the potentially negative impact of using a Zelen design), the approach to participants (the benefits of using SMS messages, framing of trial information, financial disclosure) and financial incentives (including a cash incentive with the trial invitation). In addition, it has generated further evidence to support the broad conclusions from earlier work, namely that opt-out procedures, open rather than blinded trials, paid participation and telephone reminders to non-responders improve recruitment, while various methods of consent and the provision of supplementary information appear to have little effect. The findings from this review would suggest that there are two key areas within recruitment-related research where activity could be focused. First, despite the failure of many trials to meet their recruitment targets, and the significant implications of this both practically and in relation to the delayed application of effective interventions,2–6 few strategies designed to improve trial participation have been rigorously evaluated in the context of a real trial. Almost half of the trials in this review involved hypothetical studies, including many of those evaluating changes to the consent process, and all but one of those looked at the use of financial incentives. In some of these studies, there was evidence of benefit. In others, the intervention demonstrated little impact. But what is true for all is that their effect in a real setting is unknown. Given that, we would argue that while the use of hypothetical trials to study recruitment interventions has its place, trialists should include evaluations of their recruitment strategies within their trials, and research funding bodies should support this as part of future trial methodologies. Where uncertainty exists around two or more strategies, an evaluation could actually help trialists to focus their efforts on the most effective strategy (or strategies) while at the same time adding to the methodological literature. If recruitment is carried out in phases, evaluation could be used in the early phases with later phases employing the most effective strategies identified.63 Since everyone receiving a recruitment intervention ‘counts’ for the evaluation—the study is simply counting the number of yes and no responses—statistical power is generally not a problem. Graffy et al64 have discussed nested trials of recruitment interventions in more detail. Second, previous research on potential barriers to trial participation has suggested that there are various factors that may provide the means by which recruitment can be increased, many of them related to trial recruiters. These include evaluating a clinically important question, minimising the workload of participating clinicians, removing responsibility for consent away from clinicians and involving research networks.65–67 Only 4 of the 45 studies included in this review evaluated interventions specifically designed for recruiters, and of those, only one reported an improvement in recruitment (although the data analysis did not adjust for clustering).40 There is clearly a gap in knowledge with regard to effective strategies targeting this group, and additional research aimed at how to increase recruitment by individuals or sites participating in trials would be beneficial. Other authors have used multivariable regression to look for factors that influence recruitment, although there were few insights gained from this.2 ,67 However, this approach may be worth revisiting as more evaluations of recruitment interventions are published. Evidence from this review has demonstrated that there are promising strategies for increasing recruitment to trials, including telephone reminders to non-responders and requiring potential participants to opt-out of being contacted by the trial team. Some of these strategies, such as open trial designs, need to be considered carefully as their use also has disadvantages. Many, however, require further rigorous evaluation to conclusively determine their impact. The authors would like to thank Hatim Osman for his help with screening abstracts, Marian Pandal and Gail Morrison for their help with obtaining full-text articles, and Karen Robinson and Mary Wells for identifying two studies that were missed in the previous version of this review.
. Randomisation to protect against selection bias in healthcare trials. Cochrane Database Syst Rev 2011;4:MR000012.
. What influences recruitment to randomised controlled trials? A review of trials funded by two UK funding agencies. Trials 2006;7:9.
. Statistics and ethics in medical research III. How large a sample? BMJ 1980;281:1336–8.
. Applying results of randomised trials to clinical practice: impact of losses before randomisation. BMJ 1984;289:1281–4.
. Patterns of patient enrollment in randomized controlled trials. J Clin Epidemiol 2001;54:877–83.
. How evidence based are recruitment strategies to randomized controlled trials in primary care? Experience from seven studies. Fam Pract 2003;20:83–92.
. Increasing recruitment to randomised trials: a review of randomised controlled trials. BMC Med Res Methodol 2006;6:34.
. Strategies to improve recruitment to research studies. Cochrane Database Syst Rev 2007;2:MR000013.
. Strategies for increasing recruitment to randomised controlled trials: systematic review. PLoS Med 2010;7:e1000368.
. Strategies to improve recruitment to randomised controlled trials. Cochrane Database Syst Rev 2010;4:MR000013.
. Methods to increase response to postal and electronic questionnaires. Cochrane Database Syst Rev 2009;3:MR000008.
. Incentives and disincentives to participation by clinicians in randomised controlled trials. Cochrane Database Syst Rev 2007;2:MR000021.
. Strategies to reduce attrition in randomised trials (protocol). Cochrane Database Syst Rev 2011;2:MR000032.
. Empirical evidence of bias. Dimensions of methodological quality associated with estimates of treatment effects in controlled trials. JAMA 1995;273:408–12.
. Cochrane handbook for systematic reviews of interventions. Version 5.0.1. Cochrane Collaboration, 2008. http://www.cochrane-handbook.org (accessed 7 Jan 2013).
. The effects of an open design on trial participant recruitment, compliance and retention—a randomized controlled trial comparison with a blinded, placebo-controlled design. Clin Trials 2004;1:490–8.
. The influence of risk and monetary payment on the research participation decision making process. J Med Ethics 2004;30:293–8.
. The impact of using a partially randomised patient preference design when evaluating alternative managements for heavy menstrual bleeding. Br J Obstet Gynaecol 1997;104:1367–73.
. Randomized, controlled trial of an easy-to-read informed consent statement for clinical trial participation: a study of the Eastern Cooperative Oncology Group. J Clin Oncol 2003;21:836–42.
. Telephone screening for hazardous drinking among injured patients seen in acute care clinics: feasibility study. Alcohol Alcohol 2006;41:438–45.
. An educational video to increase clinical trials enrollment among lung cancer patients. J Thorac Oncol 2008;3:23–9.
. An educational video to increase clinical trials enrollment among breast cancer patients. Breast Cancer Res Treat 2009;117:339–47.
. Informing breast cancer patients about clinical trials: a randomized clinical trial of an educational booklet. Ann Oncol 2002;13:1414–23.
. A randomized trial of recruitment methods for older African American men in the Prostate, Lung, Colorectal and Ovarian (PLCO) cancer screening trial. Clin Trials 2004;1:343–51.
. Design of trials with dying patients: a feasibility study of cluster randomisation versus randomised consent. Palliat Med 2006;20:799–804.
. Three controlled trials of interventions to increase recruitment to a randomized controlled trial of mobile phone based smoking cessation support. Clin Trials 2010;7:265–73.
. More Information, less understanding: a randomized study on consent issues in neonatal research. Pediatrics 2009;123:1301–5.
. Evaluation of a video-supplement to informed consent: injection drug users and preventive HIV vaccine efficacy trials. AIDS Educ Prev 1997;9:330–41.
. Effect of using different modes to administer the AUDIT-C on identification of hazardous drinking and acquiescence to trial participation among injured patients. Alcohol Alcohol 2007;42:423–9.
. Empirical assessment of whether moderate payments are undue or unjust inducements for participation in clinical trials. Arch Intern Med 2004;164:801–3.
. Optimising recruitment into a study of physical activity in older people: a randomised controlled trial of different approaches. Age Ageing 2008;37:659–65.
. Blinding decreased recruitment in a prevention trial of postmenopausal hormone therapy. J Clin Epidemiol 2004;57:1237–43.
. A randomised controlled study of an audiovisual patient information intervention on informed consent and recruitment to cancer clinical trials. Br J Cancer 2007;97:705–11.
. Does an HIV clinical trial information booklet improve patient knowledge and understanding of HIV clinical trials? HIV Med 2001;2:241–9.
. Multimedia consent for research in people with schizophrenia and normal subjects: a randomized controlled trial. Schizophr Bull 2009;35:719–29.
. Improving communication when seeking informed consent: a randomised controlled study of a computer-based method for providing information to prospective clinical trial participants. Med J Aust 2010;192:388–92.
. Does sending a home safety questionnaire increase recruitment to an injury prevention trial? A randomised controlled trial. J Epidemiol Community Health 2001;55:845–6.
. The impact of describing clinical trial treatments as new or standard. Patient Educ Couns 2004;53:107–13.
. Improving accrual of older persons to cancer treatment trials: a randomized trial comparing an educational intervention with standard information: CALGB 360001. J Clin Oncol 2005;23:2201–7.
. Recruitment of Hispanic women to the Women’s Health Initiative: the case of Embajadoras in Arizona. Control Clin Trials 2002;23:289–98.
. Impact of on-site initiation visits on patient recruitment and data quality in a randomized trial of adjuvant chemotherapy for breast cancer. Clin Trials 2006;3:486–92.
. Is the future for clinical trials internet-based? A cluster randomized clinical trial. Clin Trials 2005;2:72–9.
. Cancer patients’ decision making and trial-entry preferences: the effects of “framing” information about short-term toxicity and long-term survival. Med Decis Making 1995;15:4–12.
. Presenting clinical trial information: a comparison of methods. Patient Educ Couns 1995;25:97–107.
. Breast cancer prevention in community clinics: will low-income Latina patients participate in clinical trials? Prev Med 2005;40:611–18.
. Cost effectiveness of screening for clinical trials by research assistants versus senior investigators. J Psychiatr Res 1999;33:81–5.
. A randomised trial of the effects of an additional communication strategy on recruitment into a large-scale, multi-centre trial. Contemp Clin Trials 2007;28:1–5.
. Randomized trial of informed consent and recruitment for clinical trials in the immediate preoperative period. Anesthesiology 1999;91:969–78.
. Telephone reminders are effective in recruiting nonresponding patients to randomized controlled trials. J Clin Epidemiol 2004;57:773–6.
. The request for consent in clinical research: a randomised study in healthy subjects. Epidemiol Prev 1995;19:282–90.
. Publicity does not increase recruitment to falls prevention trials: the results of two quasi-randomized trials. J Clin Epidemiol 2009;62:1332–5.
. A randomized controlled trial comparing quantitative informed consent formats. J Clin Epidemiol 1991;44:771–7.
. Randomised comparison of procedures for obtaining informed consent in clinical trials of treatment for cancer. BMJ 1986;293:1065–8.
. The influence of protocol pain and risk on patients’ willingness to consent for clinical studies: a randomized trial. Anesth Analg 2003;96:498–506.
. Impact of privacy legislation on the number and characteristics of people who are recruited for research: a randomised controlled trial. J Med Ethics 2006;32:473–7.
. Recruitment in a primary care trial on smoking cessation. Fam Med 1990;22:201–4.
. Effects of disclosing financial interests on attitudes toward clinical research. J Gen Intern Med 2008;23:860–6.
. Effects of disclosing financial interests on participation in medical research: a randomized vignette trial. Am Heart J 2008;156:689–97.
. Is recruitment more difficult with a placebo arm in randomised controlled trials? A quasirandomised, interview based study. BMJ 1999;318:1114–17.
. Evaluating the benefits of a patient information video during the informed consent process. Patient Educ Couns 1997;30:239–45.
. Overcoming barriers to recruitment in health research. BMJ 2006;333:300–2.
. Heterogeneity and statistical significance in meta-analyses: an empirical study of 125 meta-analyses. Stat Med 2000;19:1707–28.
. E-mail invitations to general practitioners were as effective as postal invitations and were more efficient. J Clin Epidemiol 2012;657:793–7.
. Trials within trials? Researcher, funder and ethical perspectives on the practicality and acceptability of nesting trials of recruitment methods in existing primary care trials. BMC Med Res Methodol 2010;10:38.
. Recruitment and retention in a multicentre randomised controlled trial in Bell's palsy: a case study. BMC Med Res Methodol 2007;7:15.
. Survey among 78 studies showed that Lasagna's law holds in Dutch primary care research. J Clin Epidemiol 2007;60:819–24.
. Factors that limit the quality, number and progress of randomised controlled trials. Health Technol Assess 1999;3:1–143. Contributors JAC, CJ, MJ, RJ, MK, MP, FMS, ST and SW were involved in the design of the review. MJ developed and ran the electronic searches. Data abstraction tools were designed by EDM with input from ST. JAC, CJ, RJ, MK, PL, EDM, MP, FMS, TKT, ST and SW were involved in record screening and study selection. MP reviewed the reference lists of review articles identified by the search. ST, PL, EDM and MP undertook data abstraction and assessment of risk of bias. JAC and ST analysed the data. The article was drafted by EDM and ST, and all authors contributed to subsequent drafts. ST is the guarantor. Funding Jonathan Cook held Medical Research Council UK Training (reference no: G0601938) and Methodology (reference no: G1002292) Fellowships, which supported his involvement in this review. The Health Services Research Unit receives core funding from the Chief Scientist Office of the Scottish Government Health Directorates. The views expressed are of the authors and do not necessarily reflect those of the funders. Ethics approval Not required; this was a systematic literature review. Data sharing statement There are no additional unpublished data available.